Howdy friends.....and welcome to "Yurtcation"! By coming to this site, you are unknowingly taking a step toward a simpler form of travel. You are making a subtle statement to everyone that motels are tacky, regardless of whether they have HBO, and that camping in the dirt is for the unenlightened. You have discovered the way of the Yurt. Congratulations....you are about to embark on your first "Yurtcation". No matter what your outdoor addiction is, you will not be disappointed! 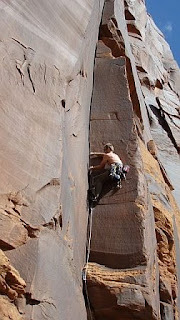 The world class crack climbing of Indian Creek is literally 25 minutes from the doorstep of the yurt. Moab is a scenic 45 minute drive away, where you'll indulge in slick rock mountain biking and tower climbing until your heart's content. 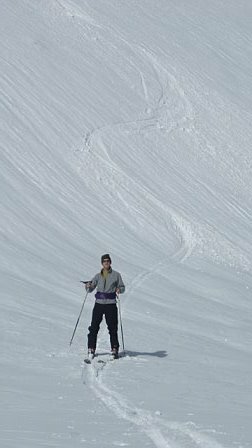 The Abajos are a stone's throw away and offer secluded backcountry and ski touring. 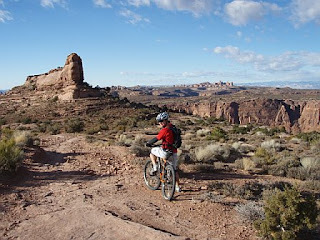 The La Sals of Moab are notorious for great winter camping and snow filled activities. You can pretend you're Indiana Jones for the day and explore the ancient ruins found in the nearby areas of Canyonlands, Mexican Hat and Valley of the Gods. In addition, you are 1 1/2 hours from Durango, 2 hours from Telluride, and a short hop, skip and a jump to the Escalante/Lake Powell area, where you will find some of the best canyoneering in the US, hands down. The town of Monticello is 15 minutes away and has a few modern conveniences like restaurants, a golf course, a college, gas stations, and a grocery store. If you're into viewing, photographing or hunting large animals, I'm located in one of the premier Elk migration areas of the US as well. The possibilities are endless, and I hope you take advantage of all of them........except killing an elk. Hi, I am a yurt. I am here to make you happy. My round demeanor is sure to please anyone. I'm located in Southeast Utah, where the hardest decision you need to make is what your next adventure will be. I hope all ya'll come and see me soon!